So, to be honest I wasn’t sure what to expect from the BPA Trail in Federal Way. I saw it on the Regional Trails System map and knew it was one I hadn’t visited, and that it was near the Weyerhaeuser King County Aquatic Center (WKCAC), but beyond that I really didn’t know what to expect. The name of the trail is an acronym of the Bonneville Power Administration, as the trail meanders underneath an electric utility corridor with the power lines overhead. 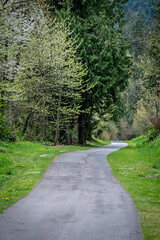 Jointly managed by Federal Way and BPA, near the trail’s midpoint the West Campus Trail breaks off as a one-mile spur and wanders down into a pine-lined gully. Being in a utility corridor has its benefits. While the views aren’t as breathtaking as other trails, it has a number of soft-surface trails to accommodate mountain bikers or runners, as well as a wide, paved surface for cyclists and walkers. The trail connects Celebration Park and the downtown areas of Federal Way with the southwest neighborhoods and allows for both commuting and recreation. The day I visited was the Washington Open Swimming Invitational at WKCAC and both the pool and trail were being well used. While I often think of regional trails as long, interconnected trails, like the Snoqualmie Valley Trail or the Burke-Gilman, it’s nice to be reminded that even a small local trail serves to connect a community and provide opportunities to get outdoors.